This pop-up champagne bar in the heart of the city will be setting up in some serious history. Middle Temple Hall, in the courtyard of which you'll find the temporary bar, was built in the sixteenth century and supposedly provided the location for the first performance of Shakespeare's 'Twelfth Night'. Joseph Perrier cuvée royale brut and cuvée royale brut rosé will be flowing, alongside a selection of sharing platters, including a cheese board with a variety of British cheeses. 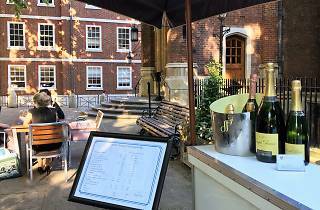 The Champagne Bar at Middle Temple will be open Thursday to Friday, 5-9pm, from May to July. Opening is weather dependent, so check with the venue before you head down. Thursday and Friday 5pm - 9pm in May, June and July. Great place for a summer drink. The Champagne bar is a fantastic place to grab a drink with friends or colleagues after a hard days work. The staff are always friendly and the bar is well stocked with a range of high-quality Champagne's and wine. 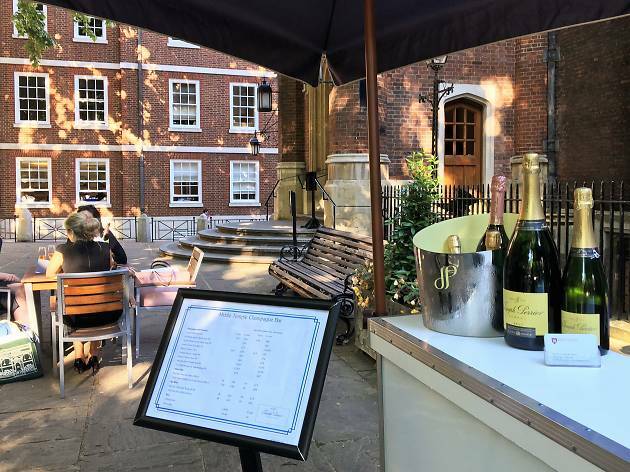 Its also a beautiful place to start your weekend, sitting outside Middle Temple Hall in Fountain Court it provides a wonderful setting for a causal summer evening. I would recommend booking as it can get quite busy. Perfect for post-work drinks! One of the few outside places to go for a drink on a sunny day that isn't absolutely heaving. What a find! This is an excellent place to relax after work with a varied selection of food platters and high quality champagne, wine & beer. The staff are friendly and welcoming. A wonderful setting to start off your weekend during summer! A truly special find ... bubbles, a beautiful courtyard under the shade of canopied trees, and lovely service all set within the walls of history! A truly fantastic place to unwind after a busy day at work set in a wonderfully discreet setting in the heart of middle temple. This is such a lovely place to relax outside with a drink after work. It doesn't feel like you're in the middle of London - you come in from bustling Fleet Street, walk down a cobbled lane and you're in a peaceful courtyard with trees and a fountain. The champagne is chilled, the food platters are delicious - great for sharing, and the service is excellent. Fabulous outdoor space. Why did I not know of this beforehand?! Such a beautiful setting for a drink when the sun is shining. Don't be fooled either, there is a nice range of wines and beer on offer as well, and the drinks are always served with great customer service and a smile.